I'm not necessarily sick OF September. Although, considering the subject matter, I could say that I am. Except that, in doing so, I would also be saying skipping OVER September into October is desirable. But no one in their right mind needs time to move faster. Except maybe Mother Nature who seems to have fast-forwarded the weather in the Pacific Northwest to November. I think I pissed her off with my "I'm ready for fall!" declarations. But I digress. No, it's that there was too much SICK in my house in September. Like, just too much yuck in one month. 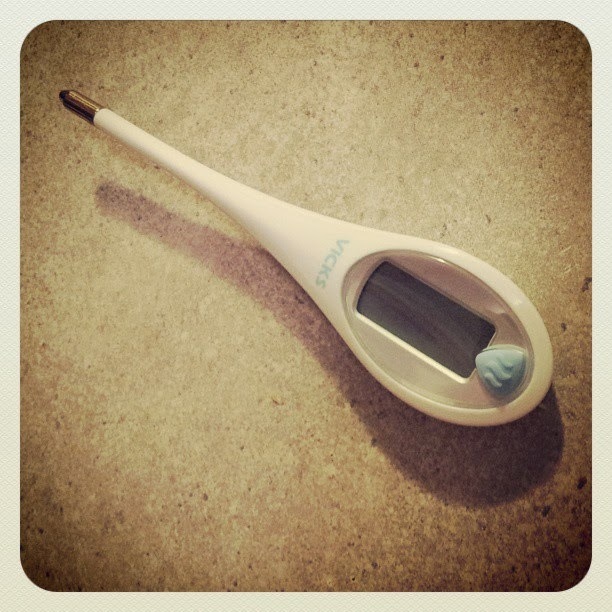 The week after school started the teenager came down with a mysterious fever. Only missed one day of school, thankfully. Her middle school makes so much noise about absences that it like seriously stresses me out. The very next week my son came down with what was probably the same thing Camryn had. Mark had to pick him up early from school on Tuesday, but he was well enough to go back to school on Thursday. OK, so each kid got a quick 24 hour illness. Not that big of a deal. Totally normal and even to be expected when you have more than one child. But wait! The very NEXT week, on the SAME DAY of the week (Tuesday night), AJ gets this really bad headache. He had had a full day of school and gone to a friend's soccer practice. Although it's kind of odd for children to get headaches, I thought he was probably a little worn out. We gave him some ibuprofen and put him to bed. Around 3:30 Wednesday morning he woke up, came into my room and told me his head was still really hurting AND his tummy didn't feel good to the point he thought he might have to throw up. I asked the typical questions moms ask like did he just need to go potty. I asked if he wanted more ibuprofen. He did so we trekked downstairs. He took the medicine, drank a little water and we went back to bed. Well, he was right about the nausea because probably less than 30 minutes later he was throwing up. That happened a couple of times before he was able to go back to sleep. Obviously this meant he wasn't going to school. I had to get up with Camryn, though, and thought AJ would get up a little while after, but he ended up sleeping until 9:00. He threw up again a little later that morning but then improved quite a bit. He was taking fluids and eating a little bit. He even had some dinner with us that night. I assumed he'd be good as new and able to attend school the next day. A little side complaint: My son's vomiting prevented me from attending my monthly wine club GNO because my friends didn't want me to possibly transport germs and give them away. Sniff. Thursday arrives and I try to gauge how AJ is feeling. He seems not totally up to snuff so we decide to err on the side of caution and keep him home. He seemed nearly normal until somewhere around 2:00 when his head started hurting bad again and he went running to the bathroom to hurl. I was all, what?? You're supposed to be getting better! Not only was he in pain and vomiting again, he now also had a low grade fever. He could not keep ANYTHING down so I couldn't give him ibuprofen to help with the headache or the fever. He had to just lie there and be miserable. And this mommy's heart ached. AJ is such the tough little man that every time I asked if he wanted me to sit with him, or almost anything I offered, he very quietly just said, "No, I'm OK."
So I would just sit down near him, rub his back or his head a little, whenever I thought I could get away with it. He went to bed at 8:30 Thursday night and slept until 7:30 Friday morning. Friday was OK, spent attempting a Harry Potter marathon and recovering. Every time I call the pediatrician's office when my kids are sick they say "yep, that's goin' around". They also say, "We get real busy when the kids go back to school....". So I gotta ask, what the eff are the schools doing with all the hand sanitizer they make us buy and send with our kids? Aren't they having the children use it?? 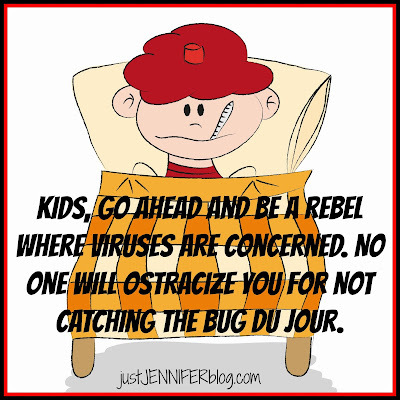 I'll end this sob story with this: To my kids, and all kids everywhere, go ahead and be a rebel where viruses are concerned. No one will ostracize you for not catching the bug du jour. And now you can find me crossing my fingers, toes, arms and legs in hopes that my Diabetic, immune compromised husband doesn't get any of this crap! Linked up with Elleroy Was Here.